Glazed Sweet Potatoes and Dried Plums with Ginger - A recipe from Savor California, the online showcase for extraordinary gourmet foods and beverages from California. Cut each sweet potato into 4 wedges, lengthwise. Cut each wedge in half across. Place sweet potatoes and dried plums in lightly oiled baking dish large enough to hold potatoes in one layer. 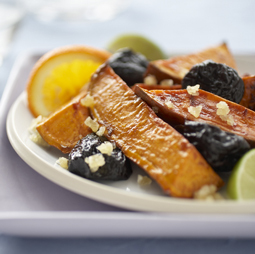 In small bowl, whisk together orange juice, honey, oil, zest, salt and cinnamon; pour evenly over sweet potatoes and prunes. Sprinkle with ginger. Cover tightly with foil; bake 45 minutes. Remove foil; baste sweet potatoes with juices from baking dish. Bake about 10 minutes more or until sweet potatoes are tender and glazed.